Since I’ve been drawing Sherlock, I figured it was high time I also gave John a go, not to mention time to Weeble-ify the pair of them. These guys were complicated! That textured wooly weave on Sherlock’s coat took forever, and I spent a long time watching episode 2 trying to get a good look on the exact arrangement of pockets and patches on John’s jacket. 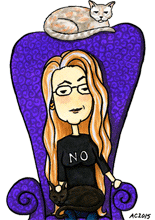 Such torment, I know. It being cartoons, I exaggerated the height difference (5.5″ in real life), and gave weeble Sherlock a thinner build than my usual weebles while drawing John Watson as dead average. It amused me to find out when I looked it up that the actor’s actually an inch shorter than me! John’s sweater was the perfect thing to use my “warm grey” markers on, where Sherlock’s done all in cool greys. Sherlock’s skin is the palest of the skin tones I have, where John got a much warmer, pinker hue, to reflect his home-from-Afghanistan tan. 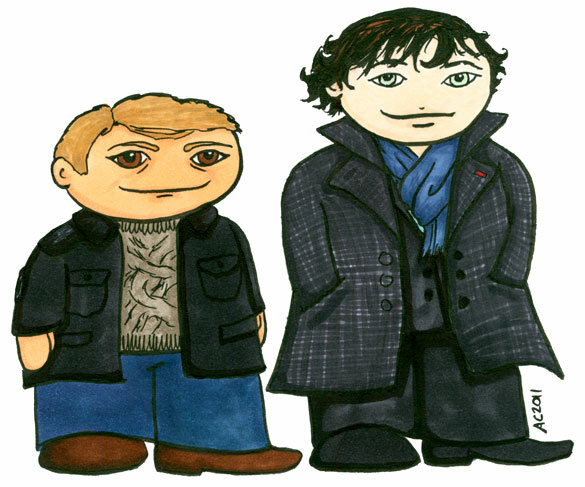 Weeble John and Sherlock, 7.5″x6.5″ pen and ink and Copic markers on sketchbook paper, not for sale.